Well-known for its authoritative and easy-to-use reference and citation system, the Publication Manual also offers guidance on choosing the headings, tables, figures, and tone that will result in strong, simple, and elegant scientific communication. This manual includes instruction on grammar, writing mechanics, and APA style to serve as an authoritative reference and citation system. Moreover, it details the treatment of numbers, statistical and mathematical data, tables, and figures. Calling all Psychology students and those determined to make good in their psychology course. Publisher American Psychological Association and author American Psychological Association have teamed up to create Publication Manual of the American Psychological Association 6th Edition (9781433805615). At present positioned as a Mybookpoo top 25 book, its approval indicates its efficacy as a study tool and an asset preferred by Psychology / General professors at schools throughout America. Within Psychology as a group, this edition is a top 10 textbook and amid the top 3 texts for Psychology and like topics. 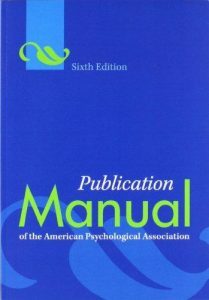 Coming in at hundreds of pages and published on July 15, 2009, the sixth edition of American Psychological Association’s Publication Manual of the American Psychological Association has been aiding students for over nine years in their attempt to grasp Psychology topics at a high level in earning their degree. With an initial list price of $24.17 for Publication Manual of the American Psychological Association (9781433805615), there are a multitude of suppliers that would gladly sell you this textbook at the original list price. At Mybookpoo, when we can, we work hard to ensure our students don’t have to pay full price for 1.10 lbs of textbook that is probably only relevant this current semester. We would rather have you singularly fixated on your Psychology course rather than worrying about the price tags of required materials. Providing discounted purchase and rental prices on a wealth of textbooks in inventory, check out the possible saving on Publication Manual of the American Psychological Association 6th Edition by American Psychological Association through Mybookpoo.